Can’t wait to get into it! 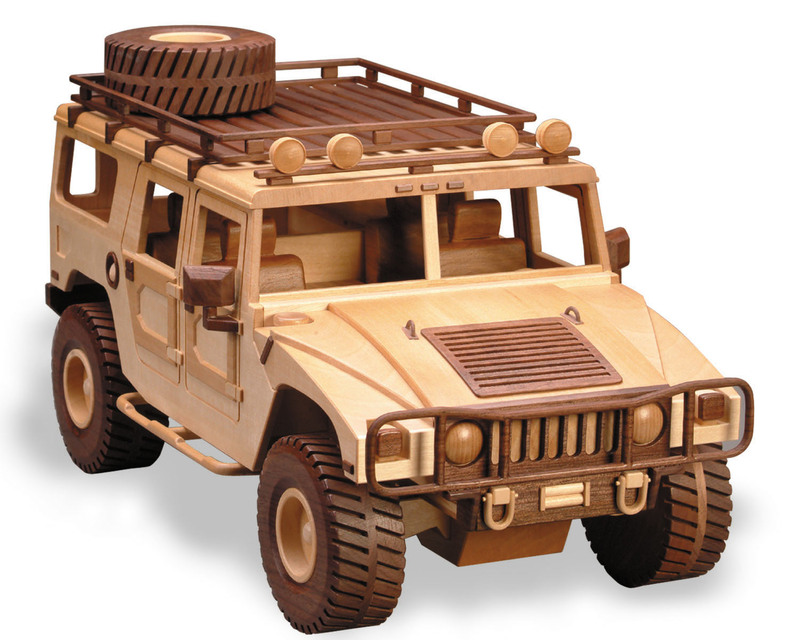 The model looks to be a pretty decent size too. Looks pretty complicated, so imagine it will take some effort to get it right. There will certainly be a lot more on these plans (and this project) when I get into it. While some of the cuts may be possible on my standard machines, being able to make a cut with minimum kert will be a real benefit too. 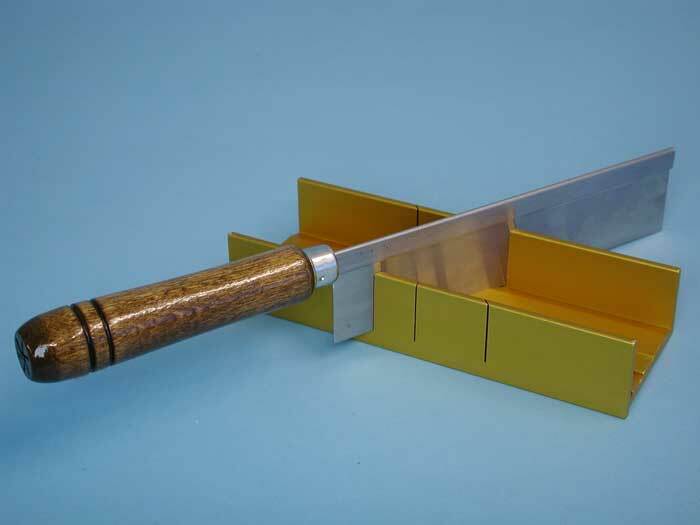 PWS are getting into thin-kerf sawblades and mitre boxes, and that looks particularly suited to toy and model making, especially when dealing with small components. Adam Savage gets intimate with dovetails! If you think about a joint, the intersection point of two materials, there are a number of ways they can be held together. If the material is metal, you can weld, braze, solder, glue, bolt, screw, rivet, glue, tape, just to name a few methods! If it is wood, obviously some of these still apply, but not all. Joints can use the strength of the glue to hold a joint together, or mechanical strength (where because of friction/fibre compression and mechanical interlock, the joint holds together), or both. A basic mitre joint requires the strength of glue to hold it together. One with dowels, biscuits, spline or dominos start getting some mechanical benefit, along with the increased glue area. A mitre lock bit pushes up the amount of glue area. A box joint even more so. 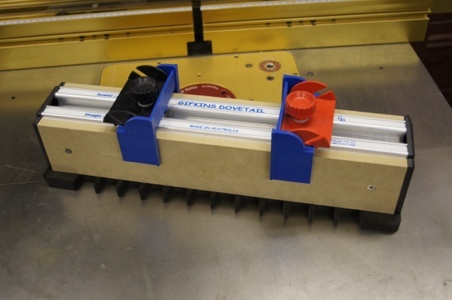 One joint that really makes use of mechanical strength and glue area is the dovetail. 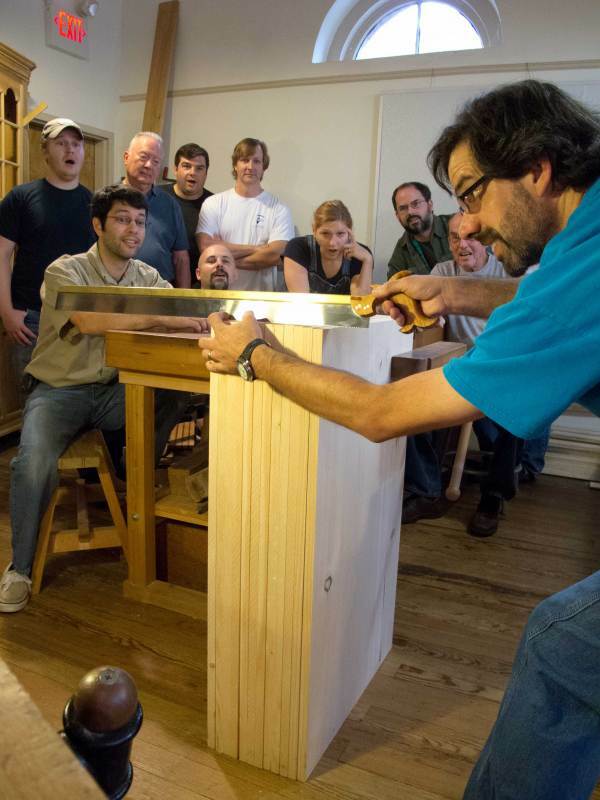 Now some people have a real passion about handcutting dovetails, and hey, more power to them. One day I’d love to have the technique down pat to be able to do that myself, but in the meantime I’ll stick with dovetail jigs. 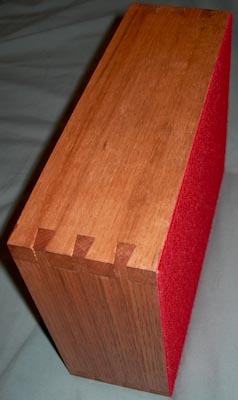 The are a number of jigs out there, but by far and away the easiest I have found to quickly and easily create a basic dovetail joint is the Gifkins dovetail jig. No need to reference back to a manual, relearn the steps, remember how to use it, it is that intuitive. I’ve referenced it on a number of occasions, and hope to do a bit of a feature on it shortly. Until then, here is the current version of the standard sized Gifkins, with the latest stops fitted. 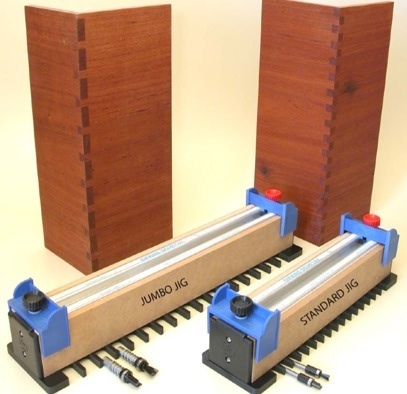 There is a jumbo version, able to produce dovetail joints up to 480mm, and 22mm thick, which would be pretty cool too. For more info, check out the Gifkins website. 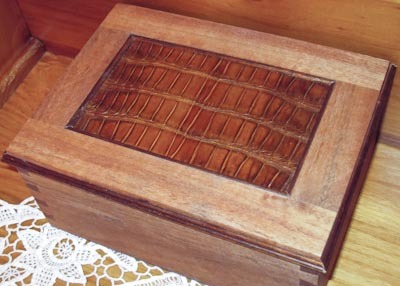 Sometimes a memory box isn’t important just for what is inside, but the box itself – the materials it is made from have as much significance as the contents. 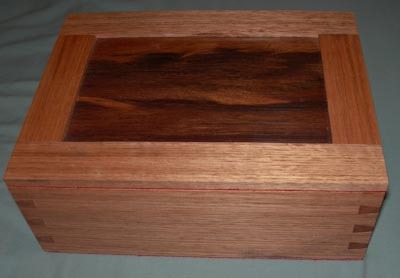 This is one of those boxes, and was one I made as a Christmas present this year for my Mother-in-Law. The request for this box came about while my wife’s grandfather’s house was all being packed for the last time (he has recently moved into a nursing home). 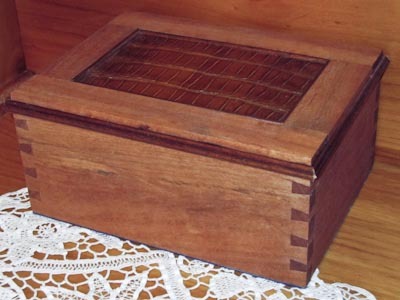 Some furniture was not worth selling, and as it was about to be placed out for disposal, the thought by my MIL was whether I might be able to do something with the timber at least, to make a memory box. 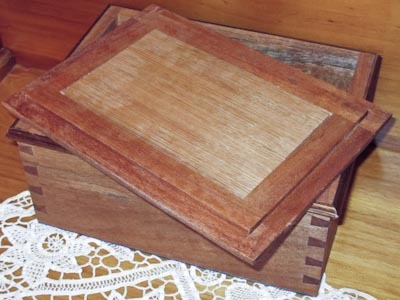 The timber came from a piece of Rosenstein furniture, made from Queensland Mahogany. There was no way that I could maintain the original finish, but that wasn’t specifically important – that it was made from this timber with family historical value was the key. 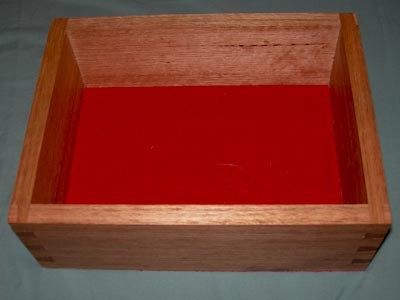 I took the panel, removed a length of beading detail, then thicknessed and drum sanded it down to a better thickness for the box. 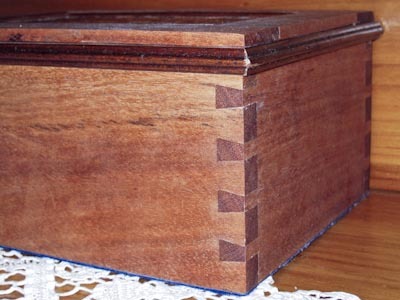 The dovetails were created with the Gifkins Dovetail Jig. Another item found during the process was a bag of crocodile leather, left over from the 60’s, when my wife’s grandmother got a pair of leather boots made. This was part of the left-over. I took a piece and glued it to some Tasmanian Oak (so inside the box would still be worth viewing). To finish off the leather detail, I took some of the beading removed at the start of the process, ripped it down with the bandsaw, and used this smaller portion (approx 1/3 of the original beading width) to create this edge detail. Wherever I used the original beading, I was particular in that the original finish was not changed at all, so the colouring of the original furniture is still represented in this reconsideration of the original item. 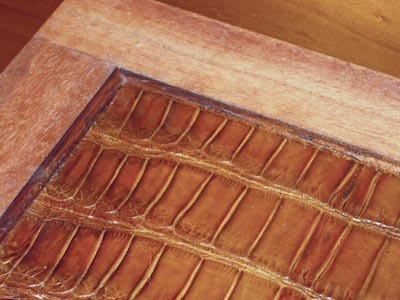 That crocodile leather is pretty awesome too, and that so much of this box carries that extra depth of meaning is significant, both for the recipient of the box, and for me as I was making it. Keeping the lid simple, I rebated around the edge to create a lid that lifts off, rather than one that incorporates a hinge. (Wooden, handmade hinges is a project for the (near) future). Here the contrast between the mahogany, and the Tassie Oak is quite noticeable. Around the top of the box (below the lid), I’ve attached the full width beading removed from the original furniture, mitred at the corners. It was originally attached with small nails, and where that occurred I have left untouched – if it has a hole, so be it. I used Titebond glue for both the dovetails, and the beading. I still have a long way to go with my box designs, but for a long time I didn’t even dare try one at all. A box is something that is often appreciated very closely, so if you don’t have really accurate joints (etc) it is pretty obvious to an even untrained eye. Creating a box that not only will contain memories, but is made from them is a particularly rewarding exercise. Christmas came and went with such a rush, that I completely forgot to even take some photos of the two boxes I made as presents. These are a few photos of one of those boxes (taken by my old man) of the box given to my Mum. The sides are Tasmanian Oak, from Misan Timbers. They have been dovetailed using the Gifkins Dovetail jig, with felt on the base, and more felt on the inside base. The finish is hard burnishing oil, followed by Ubeaut Traditional Wax applied then buffed with the Ubeaut Swansdown mop mounted in the drill press. 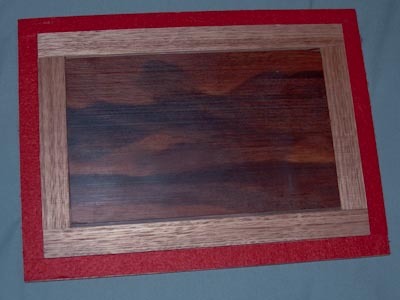 The top is framed with Tasmanian Oak, and the panel is Queen Ebony from SITCO Australia. (It is looking a lot redder than in real life). The base is actually a floating panel (as is the Queen Ebony in the lid), with a rebate around the edge and sitting in a slot cut around the base. The dovetails were perfect straight off the router table – the beauty of the Gifkins jig – once you have it set right, repeatable, perfect dovetails are almost too easy.